The FS-808 cabinet design features a classic black ash wood finish. 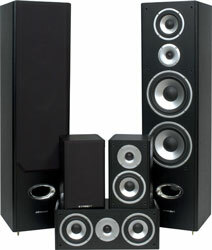 With two 8" woofers in each front speaker these speakers provide immensely rich, deep bass that you can feel. With these two powerful woofers, a 5.25 inch midrange driver and a 1 inch ferrofluid cooled pure silk dome tweeter the FS-808's ensures that you will hear every sound detail from the lowest rumble of an explosion to the faintest ping of a pin dropping. Add the CV-525 center channel and SR-290 rear surround speakers and you get one perfectly matched and powerful home theater speaker package. Dimensions (H W D): 41.3" x 10.6" x 11.8"
Dimensions (H W D): 7.1" x 17.7" x 7.9"
Dimensions (H W D): 11.75" x 7.1" x 8.25"